In case you hadn’t heard, there’s a new kind of fast-food restaurant, one that breaks all the rules about what’s fast, what’s good, and even what’s food. 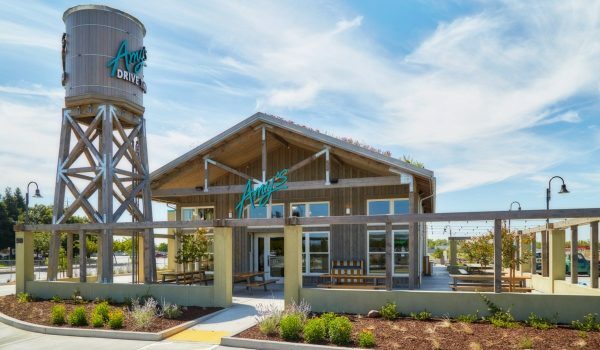 Amy’s Drive-Thru opened this summer in Rohnert Park, California, about 60 miles north of San Francisco in quasi-rural Sonoma County (better known as Wine Country, along with neighboring Napa). You might recognize Amy’s brand from the natural food freezer at your grocery store: vegetarian and vegan meals with brown rice, burritos, macaroni and cheese, and other noms. Amy’s vows to give us a better, nay, an almost uplifting experience for a drive-through eatery. The web site and press materials offer, “Authentic American classics in a new American style. Burgers, shakes and fries made with organic and non-GMO ingredients. Fresh veggies from the farm around the corner. French Fries with a story to tell. Gluten-free and vegan options for everything!” That’s quite a lot to promise. So how does the reality stack up? My daughter Anastasia and I drove an hour-plus north from the East Bay to Rohnert Park to find out. I’m not much of a hamburger person, but I like a veggie burger; alas, many of them are disgusting. Most, in fact, are not worth eating. I’ll occasionally order French fries but I try to eat better than that; I’m not a regular fast-food patron. I was more attracted to the other options: burritos, macaroni and cheese, a decent salad with vegetables that crunch; an organic gluten-free pizza on a real crust done fast enough to feel like a convenience, not a waiting game. To set the scene, Amy’s Drive Thru looks like a country fire station from afar: a timbered building with a water tank out front. When you get closer, you see the living roof, swathed in stripes of succulents. And you see the parking lot – with cars circling in search of a parking spot, and the long, long line of cars awaiting their orders. Anastasia and I decided to park and dine there, so we could check out the inside. The lot was as busy as a mall at Christmas, but we got lucky with a parking space. You can pick up a menu card to read while you’re in line, or read the overhead signs, but the line moves pretty fast. Place your order, pay and receive a number. Sit at communal tables inside or your own booth, or outdoors on the patio, where slabs of polished redwood make the nicest picnic tables I’ve sat at in a long time. Outdoor propane heaters for chilly nights, an overhang to shade you from the sun, and music that ranged from cool Americana to chill Tom Petty classics made the patio feel like a Portland café, not a burger joint. We ordered a little everything – almost. A house-made lemonade, a chocolate shake with organic ice cream, a single veggie burger with spicy sauce (chipotle), chili-cheese fries, gluten free margherita pizza, the “Sweet” salad and the vegan mac and cheese with broccoli brought our order to about $32. The wait for our food was not long; dispensers offer organic ketchup, and all utensils and servingware are either recyclable or compostable. There is every range of option for recycling your trash, and that pleased this eco-chick’s green little heart. Even the straws are a sturdy paper, not plastic. Seriously – very little plastic anywhere. We found a seat at one of those beautiful redwood tables and dug in. And the flavors? Really good. The single veggie burger ($2.99) was the best. It took two hands to hold the fluffy whole grain bun; a slab of lettuce and tomato, pickle and onion on top of a savory patty that dripped lovely spicy sauce – the best veggie burger we’ve ever had, with attention to all the little details a burger needs. Our vegan macaroni and cheese ($4.89) had crunchy broccoli florettes and a crumb crust; the dish had clearly gone under a broiler and the vegan cheese was as creamy and sharp as you’d want in your mac and cheese. We’ve never had anything like it at a fast-food place; if I lived closer, I would absolutely swoop by for a couple of mac and cheese sides and some salads on a night I wanted a fast dinner. The fresh-squeezed lemonade ($2.79) went down both sweet and sour, very refreshing on a day that hit 90 degrees; there’s the option of “no name” sodas – Amy’s own, not the Coke vs Pepsi problem. (Organic sodas. Dig it!) Our salad, the “Sweet” salad ($7.99), was something you’d easily find in Whole Foods or any sidewalk café: dark green and red lettuce, feta, cranberries, candied pecans, and yellow beets with lightly tangy balsamic vinaigrette – fresh, crisp and all organic. This is the priciest item on the menu, a reasonable cost for a filling lunch salad. The chili-cheese fries ($3.49) were the closest to what I’d call “fast food” in flavor – and still super-delicious. Freshly made French fries smothered in a bean-ful chili (you can see the beans and onions – this is not mush!) and cheese on top – this is drunk-noshing at its finest. When you really want to eat something filling and “junky,” order this and be rewarded with an all-organic, delicious vegetarian meal – we could not finish this dish! The least delicious option we tried was the gluten-free margherita pizza ($6.50) – and it wasn’t bad, it was just kind of OK. It tasted like pizza you’d get from the freezer. Have you ever bought a frozen Amy’s pizza? Or any kind of frozen pizza? Not bad, not great – but if you’re in a hurry, need something gluten-free? Hey – this is an option in a world with few enough options. We ended the meal sharing the rich, thick chocolate shake ($2.99), which almost mastered the paper straw. When I went back in for napkins, I saw two employees scooping from pints of ice cream into cups and putting them into the blender, so I can vouch for the ingredients. When we were unable to finish all of our food, the counter employee happily boxed it in a take-home box. Have you ever wanted to take home your fast-food leftovers? Have you ever sat at a (non-sticky) table and rolled your eyes at the deliciousness of the food at any fast food place? Have you ever chatted with people at other tables, asking what they were having, what it tasted like, and how far they had driven to try Amy’s fine wares? Me, neither. Amy’s blew my mind. Something else to note: There were a few kids there, but not many. I think the lack of a ball pit or climbing structure is part of the reason. Maybe gluten-free or lack of toys or brand-name sodas is not such a draw. But I will say the restaurant was quieter and cleaner (so far) than we expected, and nothing was sticky. That’s a big plus. The food was made quickly with quality ingredients and, in general, flavors far exceeded my expectations. If we had an Amy’s Drive-Thru closer than Rohnert Park, I would make it a regular stop. And I guarantee that next time I head up to Santa Rosa, I’ll stop at Amy’s again. Amy’s Drive-Thru is located at 58 Golf Course Drive West, Rohnert Park CA 94928. (707) 755-3629. www.amysdrivethru.com. Open seven days a week, 10:30 a.m. to 10 p.m. When will we be able to enjoy an Amy’s restaurant in NW Phoneix? Sounds like a place we would highly recommend and frequent!